While the child in the first plane of development (0-6 years) wants to know what everything is, the child in the second plane of development (6-12 years) has moved on to asking 'Why?' and 'How?' Nor is their questioning limited to things within their sphere of experience! The second plane child is capable of traveling through time and space on the wings of their imagination. With increasing powers of abstraction, they now want to know 'everything about everything.' They are starting to realize that the universe is an enormous, interesting place... and Montessori's Elementary curriculum, known as Cosmic Education, presents the entirety of that universe to them, inviting them to dive into its various facets. The child’s curiosity, imagination and evolving social skills at this stage work as inherent motivators towards their learning. The curriculum in such a classroom is only limited by a child's imagination! Each year, children are given a starting point with 'Great Lessons' - dramatic scientific stories which explore concepts ranging from the big bang and the evolution of plant and animal life, to the progression of humans over time and the origins of mathematics, language, geometry, and the sciences. These stories form interrelated narratives which invite the child to think about the interdependencies of life. Subsequent lessons offer keys to exploring these areas in more detail. A rich variety of concrete materials and resources (including timelines, impressionistic charts and research cards) support the child's learning in the Elementary classroom. As children make the transition from concrete learning to abstract reasoning, familiar materials from the Primary classroom sometimes make a reappearance to help forge new discoveries. The subjects that are covered in Anthea's Elementary classroom include Geometry, Math, Botany, Zoology, History, Geography, Language, Art, and Music. Through lesson plans, daily observation notes, and weekly reviews, teachers keep track of each child's progress and subject matter knowledge. Children are expected to progress through the equivalent syllabus in ICSE/CBSE/IB boards for grades 1 to 5 over the course of their time in Elementary. Textbooks from each board will be available in the classroom, to peruse at the end of each subject module. However, Elementary children have a lot of control over what they learn, and how they choose to learn it. They are required to chart their learning path for each week in collaboration with a teacher, to ensure they cover the subject matter in a balanced manner, while spending time on what interests them. Each child's response to a lesson is unique. If a group of children have a lesson on rainforests: one may choose to mark rainforests on a map, while another may want to explore the flora & fauna in a rainforest. Still others may want to paint a rainforest or build a model of it. Children are encouraged to self-teach by researching and working on projects; individually, in pairs, or in groups. They are also encouraged to share their knowledge with one another. The child’s natural learning pace and curiosity are honored, fostering a life-long love for learning. Children in an Elementary environment continue to work in mixed age groups, but, per their developmental needs, lessons are often given in small groups rather than one-on-one. Elementary children have a strong drive to be social, and being taught in small groups allows them to practice social skills including delegation of work, sharing resources, making group decisions, resolving conflicts, and working towards common goals. Frequent presentation of their research to big and small groups helps hone leadership and communication skills. The Elementary classroom mirrors society, allowing children myriad opportunities to hone skills which will serve them well for life. Children are also encouraged to explore moral and social issues to build their own understanding of what's right and wrong. Working in a non-competitive environment allows children to teach and learn from each other, evolving at their own pace. Children are free to continue to work on concepts as long as they feel necessary. There is no stigma associated with repeating lessons. Because children spend several years in the same environment, they have the freedom to revisit subjects at will. 'Going Out' is a key part of the Elementary program, and occurs whenever exploration of a topic extends beyond the resources available in the classroom. In an attempt to make children comfortable with navigating the world, we keep the resources within the classroom limited. This compels them to venture beyond the limits of the classroom to find the information or resources they need. Parent volunteers are crucial to making this program a success. Wholly planned and executed by small groups of children, 'Going Outs' are child-initiated projects with a specific purpose in mind. Children might go to a store to purchase class supplies. They may seek out a subject matter expert for a discussion on a specific topic. They may choose to attend a concert. Besides the knowledge/resources gained from the expedition itself, children learn vital life skills including finding information, coordinating logistics with a group, and following social rules while out and about. The Elementary language curriculum aims to inculcate reading and writing with fluency. In terms of reading, children consider semantics, syntax, and vocabulary across different genres of literature as well as non-fiction. They are also often asked to read aloud as they present their work orally to the class. Writing gives children a chance to practice the mechanics of punctuation, spelling, and the organization of ideas in their own presentations and creative writing. Grammar topics they study in theory include sentence analysis, parts of speech, antonyms, synonyms, homonyms and compounds as well as the parts of speech. Handwriting skills are reinforced as children maintain journals for their class work and progress. They also use their language skills outside the classroom as part of the “going out” program. The Elementary math material is beautifully designed to bring a concrete, hands-on quality to abstract mathematical ideas. 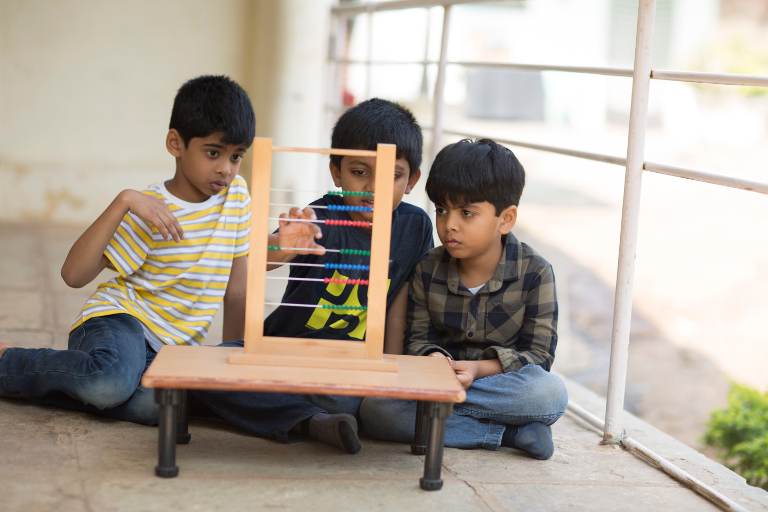 The solid materials work as a crutch, allowing even the youngest of children to easily grasp complex concepts ranging from long division to algebraic equations. By repeating work with the math materials as often as they’d like, children become comfortable with the logic behind core concepts and are just as happy working with large numbers (even millions!) as they are with smaller ones. Mathematical concepts covered include basic operations, estimation, fractions and decimals, solving for an unknown, squares and cubes, positive and negative integers, mixed numbers, and more. As with language, the math curriculum is alive in the environment, with children using numbers to record data from science experiments, or to represent varying fractions of time while working with history. As with the math material, wooden materials help master geometric terminology of all solids and plane figures. Fact cards provide verbiage for different types and positions of lines and angles, as well as characteristics of each shape. Working with materials leads children to discover spatial relationships including congruence, symmetry and equivalence. They also work on calculating areas of solids, volumes of prisms, and understanding the Phythogaras theorem, among other things. For instance, their history curriculum, or the botany syllabus, both explore the impact of geometry on designs, both natural and man-made. In History, the children learn about time and how people’s fundamental needs changed across time and culture. Starting with the creation of the universe and the solar system, the History syllabus covers the time line of not just humans, but that of the earth itself. Clocks, calendars and timelines are all used to consider when man became a part of history and how he continues to shape it. A lot of awe and gratitude is evoked in considering all the things that happened in the past to bring us to where we are in the present. Children in the second plane look for heroes, and history provides plenty of opportunities to pay homage to unsung ones, even as children begin to form their own moral compass. The Elementary Geography curriculum is a broad one, encompassing earth science and physics. It stretches to ask about all the elements which shape the world, wondering how and why things work the way they do. The syllabus ranges from water cycles, tectonic plates and other natural phenomena; to physical sciences such as electricity, viscosity, and magnetism; through to the socio-political ramifications of geographic migrations. Through experimentation, children gain firsthand knowledge of the universe’s natural laws and start understanding how the world works. Students learn about life systems such as the ones within the human/animal bodies, as well as cell structure and the function behind different plant and animal parts. They study the classification of plants and animals and gain an appreciation for nature in its different forms. They are also encouraged to study the various ways in which evolution shaped the way animals/plants adapted to their environment, and how they continue to evolve. A lot of time spent outdoors in nature, as well as with the class’ plants and pet, allow for a hands-on appreciation of flora and fauna. Children are exposed to different mediums, artists, movements and periods as part of Elementary’s holistic art & music curriculum. Rather than delegate a single art or music period, the Elementary environment nurtures creative expression across subjects. Children are asked to use art, music and drama in their presentations, to whatever degree they feel comfortable. Concepts such as beat, meter, rhythm, tempo and pitch are introduced to help children listen to and empathize with different forms of music. Materials are also made available to help them create and express themselves using art and music.